Finding it difficult to get the best suppliers and products for your e-commerce business, discover SALEHOO and see the difference! What if you get started speedily with your dropshipping or e-commerce business with SALEHOO today? Yes, you got that right. E-commerce and dropshipping starts with finding winning products and reliable suppliers. The company prioritizes customers by giving them the needed support to get started and running. If you want to start a dropshipping business and don’t know where to start from, SaleHoo might be a perfect option. 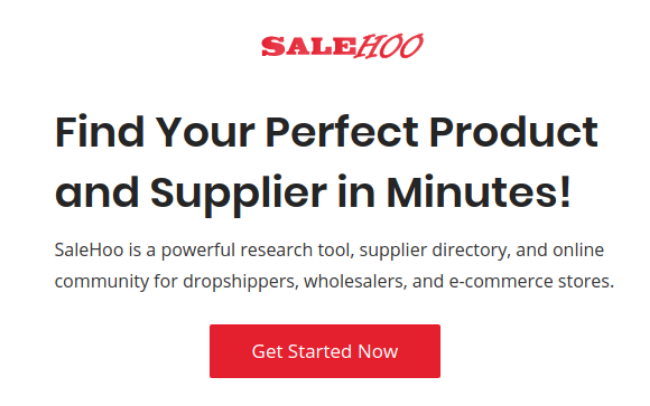 SALEHOO is a sophisticated research tool, an online community and supplier directory for wholesalers, dropshippers and e-commerce business owners. The company has been around since 2005 and has assisted more than 137000 people get started with their online dropshipping or e-commerce business. As an easy to use tool, online sellers have relied on this tool to find high in-demand products from reputable and low-cost manufacturers and suppliers. Most importantly Salehoo is a US based dropshipping service with fast shipping (2-5 days). Salehoo products range is extensive as it is derived from many suppliers. To get started with SaleHoo, you need to take three steps and there you are up and running with your ecommerce business. Lets you discover hot-selling & trendy products. Find which products come with the highest profit margins and sell the most. Spot suppliers with lucrative product ideas that are low-cost. Fliterreliable and trustworthy wholesale or dropshipping suppliers. Get insider deals from suppliers. Organize details of suppliers and negotiate the cheapest cost for the product with no minimum orders. Set particular search criteria to help filter through more than 8, 000 global and local suppliers. Contact suppliers to get the new products you’ll be selling for huge profit to your customers. Once subscribed, you’ll get unlimited training sessions and quality and efficient customer support from the company to make things easier for you to work with. Anybody who wants to provide fast shipping times & quality products to their customers. How much does SaleHoo cost? Subscription plans have the same range of features included. The only difference is that with Lifetime access you don’t have to pay each year. It is up to you to choose which plan suits you. Yes, there is a refund policy in place. The company provides a 60-Day money back guarantee. If you’re not completely satisfied with the service provided, you should email the receipt to customer service at support@salehoo.com. Access to a community forum. the SaleHoo forum, I was turning 300-400% profits on every item I sold! Salehoo is not anything close to being a scam system. It is very obvious that many e-commerce companies have used it since its inception in 2005. From experience, it has served its purpose to help find good suppliers. Their prompt customer service shows they are always ready to help people solve their problems with the system. Kaylee Larson and Bob Case both attested to the quality service rendered by this company. SALEHOO is not new in the ecommerce and dropshiping service providers. It is known for its good customer service and efficiency. Many users over the years have commended the service received by using this system for their ecommerce online business. It is a good place for beginners to learn the ropes of finding suppliers and products they want to sell online. Disclosure / Disclaimer: We do NOT own the software we Review. If we create a link to a software in a review, in most of the time, we do get paid a commission if you purchase the software or service through the affiliate link. But we do not receive revenue for writing software reviews. And although we make money from those affiliate programs, we always give our honest opinions and experiences on those topics or software.